The Broomall Fire Company will be visiting The Grayson School during Fire Prevention Week on Tuesday, October 9, at 9:00 a.m. to share the importance of fire safety and prevention with our K-5 students. Our entire school takes part in monthly “surprise” drills to insure that our students are both aware and prepared in the case of an emergency. 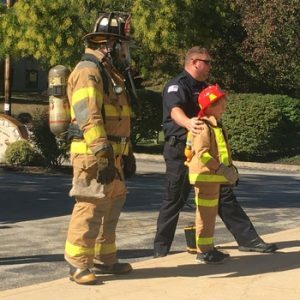 As the official sponsor of Fire Prevention Week for more than 90 years, the National Fire Protection Association (NFPA) works with local fire departments throughout North America to promote their annual campaign and reaches out to the public directly to encourage everyone to take action to be safe. This year’s Fire Prevention Week theme is: “Look. Listen. Learn. Be aware – fire can happen anywhere,™” and works to remind the public that fires can and do still happen – at home, as well as other locations – and that there are basic but vitally important steps people can take to remain safe. For a wealth of information and resources about this year’s “Look. Listen. Learn. Be aware – fire can happen anywhere.” campaign, visit www.firepreventionweek.org.